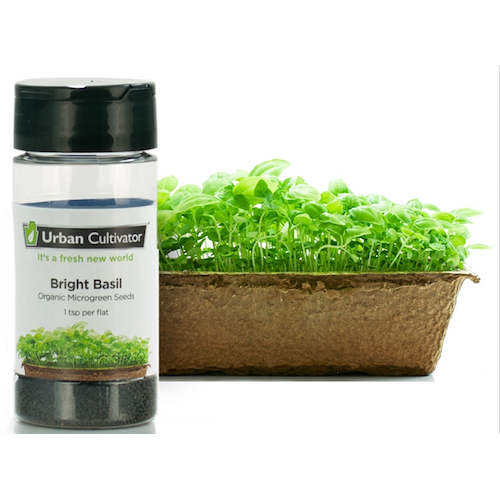 Organic Bright Basil seeds perfected for indoor growing. Grows four flats of Bright Basil microgreens. The name "basil" is derived from the Greek word for king or royal, a nickname and reputation it earns by being the most popular culinary herb! Its popularity spans the globe since basil proves to be a good match for almost any kind of food. Basil is also known as the "tomato sauce herb," because it goes especially well with tomatoes and Italian cuisine. Unlike many other herbs, it is almost impossible to use too much in your cooking. Basil is a tender herb that is typically grown in warm, tropical climates and is native to Asia and Africa, but can be cultivated in many areas around the globe. It is usually used fresh in recipes, generally added at the last moment, as cooking destroys much of the flavour.